Standard software package for enterprise production and operation processes automation through the use of automatic item identification aids (RFID, bar coding) (SSP EP&OP). System type: cyber-physical system (CPS) according to foreign classification. SSP EP&OP system is designed for real-time production process automation (APCS level) and marked material object life-cycle status tracking (monitoring). SSP EP&OP system is configured in accordance with software/technology platform concept, providing real-time acquisition and tracking (monitoring) of data on marked material object (items, documents, packages) status and their life cycle process characteristics (metrics) with arbitrary domain adaptability and information support of decision-making on production and operation managerial and engineering system control. SSP EP&OP system provides applied subsystem, task and function implementation in common computer environment, which allows the consistent operation of workstation and terminal users with input, output, circulating and stored data, including data recorded in RFID tags and barcode labels attached to items, containers or supporting documents. SSP EP&OP provides a flexible adaptable software system allowing trained enterprise (unit) managers to adapt software to particular enterprise (unit) specific features without coding and specific user requirements and also to improve and upgrade the implemented system without the Developer involvement. These components communicate within local computer network (LCN) via wire and wireless communication links. Terminals can communicate with monitoring system via Internet. The number of simultaneously functioning workstations and terminals is not limited. Preproduction process status tracking (material support, technology development, standardization, etc.) based on a ”virtual item” concept, i.e. by introducing an “item substitute” with barcode labels (when item itself has not yet been manufactured) into paper document flow. The concept allows expanding the scope of item life cycle processes that can be automated. The use of automatic identification aids in acceptance tests of components supplied by outside enterprises (organizations). Real-time acquisition, processing and visualization of data on item and related processes life-cycle status. The use of pluggable electronic measurement aids with provisions for automated item geometric characteristics measurements. Combined use of HF/VHF RFID tags and noncontact vision-based measurement system in the context of a specific industrial production. Using terminal camera for item physical configuration photographic recording. Tools inventory and transfer during operation, testing and repair. Production metrological support process automation. Automation of product quality data acquisition and product inspection processes. RFID aids use in warehousing operations automation. RFID aids use in product assembly operations automation. Production control decision information support with the use of automated data acquisition system. RFID aids use to automate control processes of current product delivery status by selected criteria, in particular to prevent counterfeit parts use in aircraft production. The application of software/hardware system for material flow object status identification and tracking for labeled cargo transportation management. 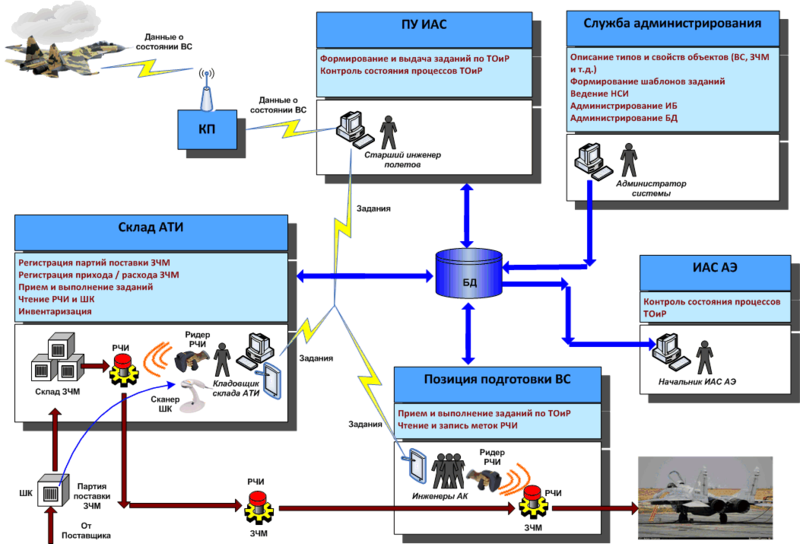 The application of aircraft maintenance process RFID and automation aids. The application of aircraft repair process RFID and automation aids. The application of RFID aids in automation of warehousing aircraft unit replacement operations during maintenance & repair processes. The application of RFID and process automation aids to support the acquisition and processing of data on aircraft reliability (operational readiness) and aircraft maintenance and repair cost and labour intensity. Information decision making support during aircraft operation management. Pre-production engineering (PPE) is a central and most labor-intensive and costly work stage, that determines the rate of new product development and launching into production. PPE methods provide a solution to major challenges of new products rapid launch, mastering a certain niche market and profit-making. Current PPE process automation is oriented mainly to CAD/CAE/CAM type software use, which provides the local automation of designer, production engineer and NC machines work, but does not allow to manage PPE as a single sub-process within a product life cycle. Automated data acquisition and pre-production process status tracking (material supply, technology development, standardization, etc.). Implementation of a ”virtual item” concept, i.e. introducing an “item substitute” with barcode labels (when item itself has not yet been manufactured) into paper document flow. scheduling of work on PPE. 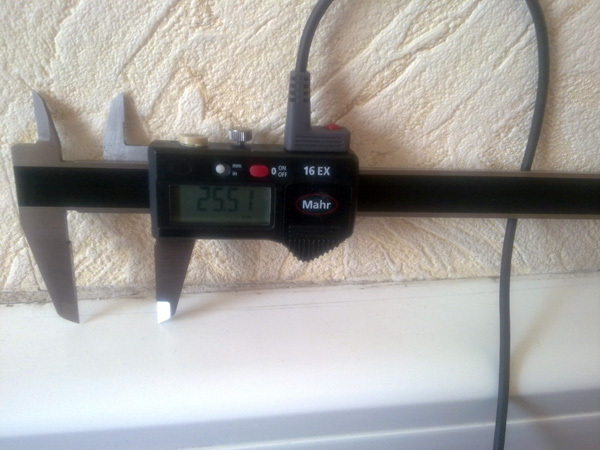 Measurements carried out during manufacturing processes (e.g. item geometrical characteristics measurement) should be valid and reliable, hence, measurements should be performed by authorized for specific product measurements performers using specific, timely verified measuring instrument (MI) with a specified inherent measurement error. Measuring instrument readout is usually performed visually, with mainly manual measured material object characteristics entry via a terminal interface, which is a potential source of incorrect data, registered in system data base. Unambiguous identification of an item being measured and a measuring instrument with machine-readable tags. MI tag contains data on last verification date and instantaneous measurement error. Measurement procedure regulation by electronic tasks specifying who and when should measure specific characteristics of specific products using specific measuring instruments and procedures. Provision of task execution fact record with performer signature and task execution control capability. 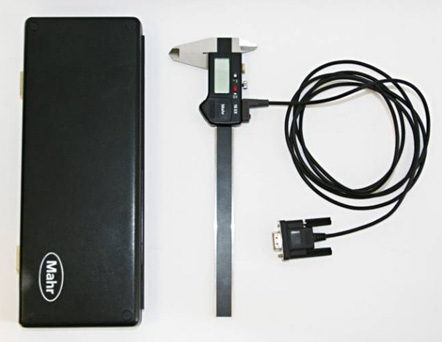 The use of automatic digital measuring instruments with interfacing capability to a terminal computer. product quality and quality assurance process status control. Aircraft operation. Aircraft maintenance and repair. Complex science-intensive equipment maintenance processes are continuously improved and in this context the primary focus today is on the use of on-condition maintenance methods. The use of on-condition maintenance methods provides operating costs reduction by 20-24%. The obvious way to improve aircraft on-condition maintenance is on-line monitoring of aircraft characteristics and maintenance and repair processes. 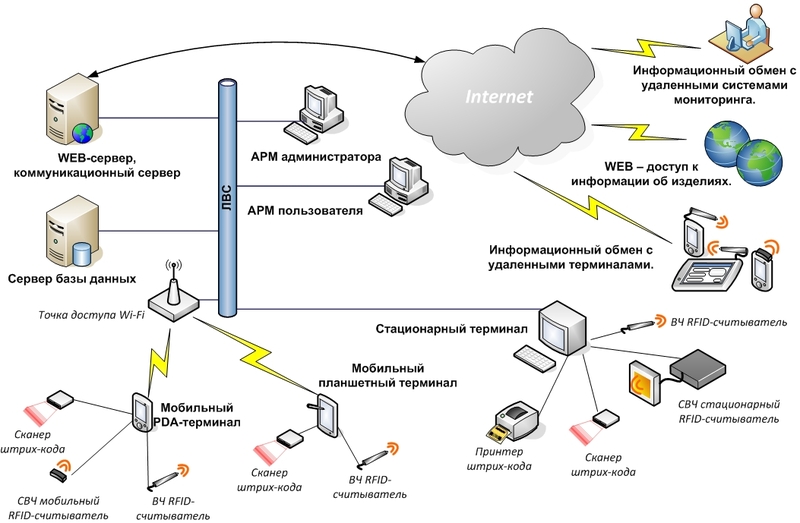 The complete solution of item and related process data acquisition and processing task can be achieved only through the expansion of existing IT suite as part of maintenance system through the implementation of automatic item identification technologies, tracking of the characteristics (metrics) of production and maintenance processes as well as wireless communications and mobile devices (terminals, readers, sensors, measuring instruments, etc.) and their consistent use. Future aircraft maintenance and repair is associated with the wide use of e-maintenance supported by “smart logistics environment” based on embedded into aircraft components smart sensors (RFID tags, sensors, etc.) and mobile data acquisition terminals correlating data contained in item machine-readable tags with database information and recording specified maintenance and repair process characteristics (metrics).